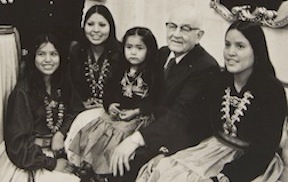 The Indian Student Placement Program became a service provided by The Church of Jesus Christ of Latter-day Saints to help Native American members of the Church. Many feel that the effort fulfilled a responsibility found in the Book of Mormon (2 Nephi 10:18). In 1947, Helen John, the sixteen-year-old daughter of Navajo beet-field workers, requested permission to stay in Richfield, Utah, to attend school, which at that time was not available to her on the reservation where she lived. An informal placement program began from her request, through the efforts of Golden Buchanan of the Sevier Stake presidency and Miles Jensen, with Elder Spencer W. Kimball's support. The program began with three students in 1947 and expanded to sixty-eight in 1954, when the program was formalized under the Church Social Services and the Southwest Indian Mission. In the program, the biological parents of a Native American student at least eight years old could request placement with foster parents for the school year. The children had to be baptized members of the Church. The foster parents were recommended by their bishop for participation in the program, and they agreed to provide room, board, and clothing free of charge. The goal was to help the children have additional educational, spiritual, and sociocultural experiences. Another goal was to develop leadership and to promote greater understanding between Indians and non-Indians. The program grew rapidly and peaked in 1972 with 4,997 students placed in homes in four western states and leveled out to about 2,500 students a year. In the 1980s, several Indian tribes dramatically improved education on the reservations; consequently, the Church supported this effort by limiting the Indian Student Placement Services to high school students. Accusations were directed at the Church indicating suspicion that the Church used its influence to push children into joining the program. In 1977, the United States government commissioned a study conducted under the auspices of the Interstate Compact Secretariat. Its findings rejected such accusations and the committee agreed in to permit the Indian Student Placement Program to continue. The last student in the program graduated from high school in 2000. The program has not been formally discontinued. This page was last edited on 25 May 2016, at 00:27.